I had to do this project for many of my young friends who are interested in LED’s but do not know how to go about it. I also had the same problem but was fortunate enough to get HELP from my friends at www.Instructables.com. which anybody can do if he has the mind to. Here I have shown you many types of power supply which can be used to glow a LED. I have also shown here how different types LED's can be made to glow and use it in you project. A 15 mm LED has two legs, the long one is the Positive and the short one is the Negative. It consumes 15 milli Ampere of current and can glow on 3 Volts DC Current, or a 3 volt battery. LED’s are Diodes and the current can only pass through the POSITIVE side. Always remember to maintain the POLARITY of the LED, that is (plus to plus) and (minus to minus) otherwise it will not work. LED is a one way street. Now you know how to connect an LED in your circuit. If you are interested, here you can see the different parts on an LED. This set of rules will help to build a Project, follow them. Here I have shown the Resistors to be used with 6 volts, 9 volts and 12 volts DC. You can go on adding any numbers of LED's. Remember that the first line of LED should be in series and the second line onwards should be in Parallel. Step 4: USING LED's WITH AC TRANSFORMERS. LED can be run on AC or DC current. If you want to run it on DC that is Battery Then you must use Resistors. Now what is the load the AC Transformer will take? For that you will have to measure the output voltage of the AC Transformer with a Multimeter, say it comes to 14volts. The subject transformer was 14VAC 500mA output without load. First, we have to be aware that the 14V rating is known as the RMS voltage, and is the effective average power of the sine wave. The maximum voltage, which we will subject our LED’s to, is about 1.4 times higher. So, we will be using 19.6 volt as the basis of our calculations. 19.6 / 3.5 = 5.6, which we round up to 6 LED’s. across the supply! 15 times means 90+90=180 LED’s. Step 5: LED's CAN GLOW DIRECT ON 220volts or 120 Volts AC MAINS. You can use LED’s directly on 220 volt or 110volt AC. Same principal applies, one line opposite to the other while using AC. The value of the Condenser and Resistors are given in the diagram for 220 volts and 110 volts. The condensers must be non-polar. You can use 30 + 30 LED's on a string, after that if you start adding more LED's the light starts to get dimmer. Here you can see the various types of 1 watt LED’s. Their polarity are marked on the legs or body. so you must calculate the power source to be used with this LED. Step 7: USING 1 WATT LED WITH BATTERY. Every thing is explained in this Diagram. Step 8: RESISRORS TO BE USED WITH 1 WATT LED. You can use different types voltage and resistors with this LED as shown in the Diagram. 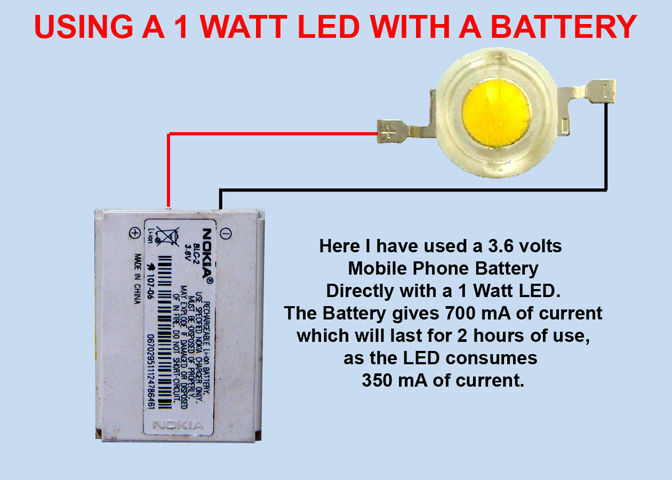 Everything is clearly explained in the Diagram and it is very easy to use strip LED's. Now you can make your own LED projects. Hello all! im looking to put some small Leds on a new guitar fret board on the side to see side dots lit up for playing at night. Can anyone help me with a circuit that would run off a 9 volt battery when guitar jack is plugged into the guitar lights come on! I know I will need 10 micro lights but have to be really good quality. That's all I know I may try a 20 light on next project. Thanks so much. Can you please let me know what resistor I will use with this led to glow with a 4 v battery??? Can you please let me know what resistor I use if I want to glow this led with a 4 v battery??? what power supply can I use with a 2m leds strip 5v what is the amp requied and can I use batteries 3 nmh rechargeable. These are addressable RGB Leds ? If I want to run 6 led of 1 watt with 5 volt supply can my led glow up? Hi I am building a model airport runway, And will be using 550 led diode 3 and 5 mm. Of various colours. What I like to know is how many led diode can I connect to a 12v DC Transformer ?. I am using resistors on each diode. Thanks for your help regards. Hi Do anyone have a answer for this question? Thank you. Whomever produced that first image of the LED diagram must have taken art lessons from Escher... Pretty cool. I have an 1w x 7 light. I,m set this lights serios system. Then can i connect a 12v ups battery without any cercuit? Sir, please exlain me. Hi Sir, I got a led project that I assume is similar to your "step 4" the ac transformer. I have a power supply that step down to 9VAC and 200ma. I am using the 1 watt LED, which is exactly the one you have on your step 7. My question is: I assume I can put minimum 8? : 4 in series ( 9 x 1.4= 12.6v) and 4 more on the negative cycle. My second question is: What is the max number I can put them? I assume is 15 x 8, so 120? Sir can you tell me the ampere rating of the step down transformer required to glow a single 1 watt LED light from a 220v source? Hello I want to connect 20 1W LED. which one should I use power supply? My Prof recommend me to use 3V-20W but I cannot find it. what is another option to do it? I can divide 10/10 so 2 groups. this project is killing me. Hello, i have a question about connecting 1W, 350mA leds to a power bank. and what would be the best way to do it? I think i should connect them parallel, and add resistor, but i dont know which DC output i need to consider for this? It says it is 5.1V, 2.1A(3.6A max), but battery is 3.6V. 7x350 is 2,450, but if i connect them either way, each led will get 300mA and should work just fine but dimmer? But i need help with figuring out the voltage, and what resistor if any to use. This is my first project. I have a 30w led I would like to power from a wall outlet with as few components as possible. I found an led driver made by Introcircuit with an output "DC 12v, 2.5a, 30w". It has 110 power outlet plug coming out of one end of the driver and a red (+)and black (-) wire coming out of the other end. The led (pic attached) I have doesn't have a (+) or (-) indicator on either connector. Does it matter which connector I solder the wires to?